PC sales may be grim, but it's not Microsoft's fault. PC sales are slumping and the technological prophets of doom are quick to point the finger at Microsoft and its Windows 8 operating system. Last week IDC Vice President Bob O'Donnell not only expressed disappointment that Windows 8 wasn't able to reverse the trend, but asserted that Windows 8 was the reason for the slowing market. But the PC sales problem doesn't begin or end with Windows 8. Even if Windows 8 were the most well-received and critically acclaimed operating system ever, PC sales would probably still slump. Even if they won't render the PC obsolete, the rise of tablets and smartphones have certainly made them less necessary in our day-to-day lives. They are no longer just an accessory to the PC. In many cases, they're a functional alternative. The tablet market has grown rapidly since 2010, with the latest reports signaling the space is on its way to becoming a $64 billion industry, with 150 million units expected to ship this year, according to ABI Research. When you compare the rapid growth of tablets to the general decline of PCs, it's evident people are opting for a tablet to supplement -- and sometimes even replace -- their aging computers at home. 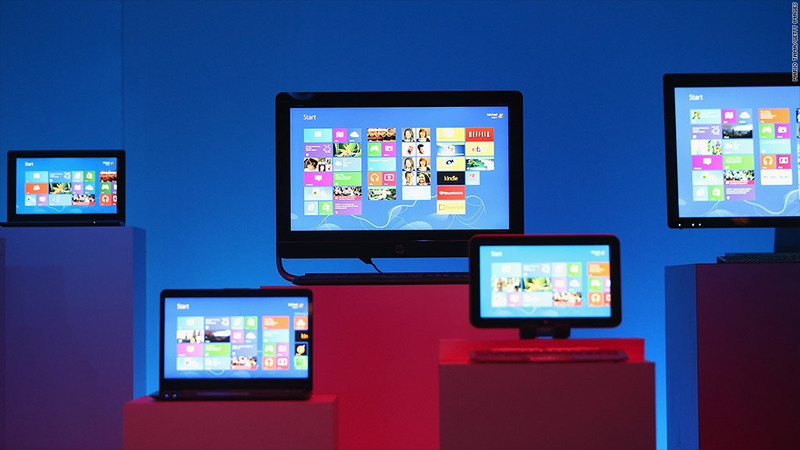 By 2015, Gartner expects tablet sales to exceed PC sales for the first time. Although PCs are still very much the best tool for work and other productivity-related tasks, tablets (and in many cases, phones) can now handle the vast majority of activities we need them for: Web browsing, email, messaging, music, video, social networking, etc. They're slimmer, lighter and more versatile. It's not unlike the move from tower PCs to laptops in the early 2000s, when the portable computers started to offer an experience on par with their stationary counterparts. The only major difference this time around is that a whole different set of players are leading the tablet space -- from the hardware to the software makers. Another factor dooming the PC: Most computers purchased within the last five years can still perform admirably today. New computers are noticeably better, but for the large swath of consumers who are turning to phones and tablets for all their casual computing, the necessity of regularly buying a new computer has become less pronounced. For those who sit in front of a home PC just a handful of times a week, they are probably fine extending the life of a slightly creaky machine. So it's not so much that Microsoft (MSFT) has scared everyone away. It's just that everyone was already drifting towards the latest evolution of the PC -- something new, exciting, and at times, better. Trying to protect the top dog status of the PC now is like trying to preserve the status of the vinyl record over CDs. They're superior in certain aspects, sure, but they're also significantly less convenient. And that was really Microsoft's main mission in creating Windows 8 -- not to save PCs, but to guide the company through a transition when the capabilities of tablets and PCs are merging. Microsoft wants Windows to run on both. The strategy understands the importance of keeping the PC around, but Microsoft ultimately realizes that most people will eventually opt for a tablet as their main "computer." Microsoft investors aren't necessarily convinced, however. The stock is down about 4% since the first quarter PC sales numbers came out. On Thursday, Microsoft will give shareholders a glimpse of the first full quarter of Windows 8 sales. They probably won't be pretty, but investors would likely be well served to take a long-term view.